With a few official weeks of the cold and bitter winter left to go, we might start to feel like were drowning in the melting snow. What better way to get out of our wintertime funk than to head to the great outdoors for some spirit-lifting activities? Given March’s propensity for being both frigidly cold and delightfully spring-like, Montreal has the perfect line up of festivals to suit the changing temperatures, as the month comes in like a lion and goes out like a lamb. Whether celebrating the arrival of blooms and fresh greens or appreciating the city’s renowned artistic scene, Montreal has a number of upbeat events to keep you going. We’ve curated a roundup of key March events happening in Montreal in the days and weeks ahead. Open until the end of April, the Butterflies Go Free attraction at the Montreal Botanical Garden is said to symbolize the city’s eventual shift into spring. 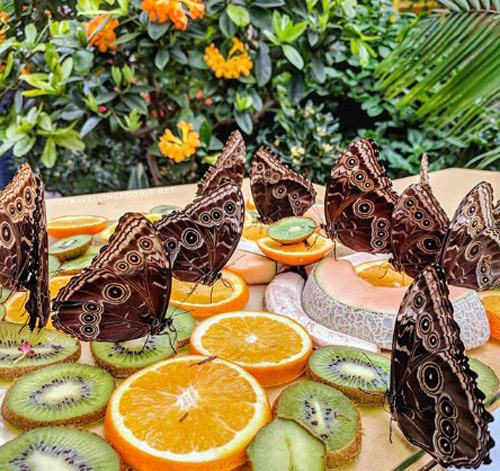 With over 20,000 butterflies and moths released in the confines of the climate-controlled greenhouses, attendees can expect to see up to 75 different species fluttering about. Most of the species originate from the United States, Costa Rica, El Salvador, the Philippines, Malaysia and Tanzania, and therefore require a humid temperature to survive. The heat, lush greens and the flowers’ sweet fragrance are believed to help visitors forget the winter blues, creating an almost spa-like setting. With internal temperatures of 25C to 36C, the Botanical Garden greenhouses have a warm climate, which may encourage you to drop your layers and step out in your springtime finery instead. For an eighth season, Montreal’s biggest urban lumberjack party will take place in Verdun for four days of square dancing, maple tires and woodcutting. From March 22nd to the 25th, La Cabane Panache et Bois Rond is the guiding beacon for celebrating sugaring time. Festive music, traditional food and drinks and artisanal activities work to create a true Canadian vibe. Over 80,000 hungry lumberjacks are expected at the largest maple festival in Quebec to enjoy their first breath of springtime air. Montreal foodies’ uncontrollable need for maple everything is likely to be satisfied. For the first time ever, Cabane Panache et Bois Rond is inviting an official spokesperson: actor Rémi-Pierre Paquin. Now running until March 25th, Art Souterrain is an art festival that occurs in an environment that differs from the traditional exhibit space: Montreal’s underground city. Offering 32 kilometres of tunnels, this subterranean space is one of the biggest underground pedestrian walkways in the world. Founded in 2009, each year Art Souterrain showcases international contemporary art institutions, artists and the architectural and cultural heritage of downtown Montreal. The festival aims to make visual art more accessible to a wider and inexperienced public by creating a concept that distances itself from the gallery.